There is only one chance to make a good impression sometimes. For those in business, the perfect suit is that first impression moneymaker. The best garment bag for suits helps your suit stay wrinkle-free and stain-free during your travel. As superficial as that may seem, it’s really about the human brain. People in business don’t like to get caught up on wrinkly suits or stained shirts. Typically, this signals that the person doesn’t care about their appearance, which is important in business. 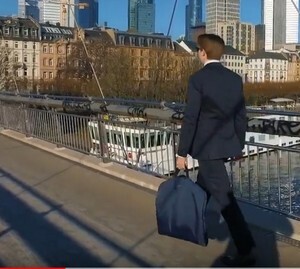 What is the best garment bag for suits in April 2019? What’s Your Budget for a Garment Bag? Are wheeled bags better than handheld or shoulder strap garment bags? Do garment bags work for dresses and suits? What materials work best for a sturdy garment bag? Keeping your suit clean, tidy, and wrinkle-free is just like taking care of your superhero uniform. You don’t want to spend any extra time on your travel dates trying to get your suit cleaned. For this reason, high-quality garment bags are in high-demand. Here are a few comparisons that we made about our favorite brands. These garment bags were selected for reviews because of their high user ratings and customer satisfaction. We ranked them based on their portability, ability to keep suits wrinkle-free, and ease-of-use. 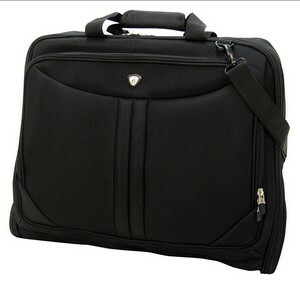 The Travelpro Platinum line has always been a favorite of business travelers. The bag is small, provides lots of organization, and can fit several garments in one as well as toiletries. The Platinum Magna Rolling Garment Bag has the best features yet with smooth-rolling wheels, easy-to-use handles, and tough nylon exterior. The wheels on this bag make it a dream to move with through the airport. The inline skate wheels and extendable handle are easy to use, making it a swift walk from security to the terminal. The large exterior pocket and interior pocket design also give you quick access to everything you need. The construction of this bag is truly outstanding. The internal chassis forms all of the pockets and style of the bag. You won’t feel like it’s going to fall over at any point, and it’s easy to pull along after you. You can stow away the handle at any time, and it stores nicely into the overhead. Best of all, your garments stay neatly packed inside of a decadent interior. There are multiple pockets and pouches inside to store toiletries, ties, socks, and so forth. We also like that the Travelpro team conducts several travel user tests, such as a fabric abrasion test, extension handle open, cold crack drop test, water repellency, and product stability test. 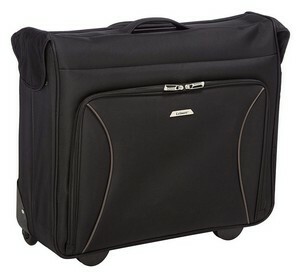 The Travelpro is one of the top garment bags available right now. Many business travelers have used the Platinum garment bag line for over 10 years. If you are looking for a sturdy carry-on with lots of packable and organized space, this is the perfect one to go with. The WallyBags Luggage is a 40-inch garment bag that includes a hanger at the top of the bag to keep your favorite suits and shirts as tidy and wrinkle-free as possible. Whether you are traveling by plane, car, or train, you can easily pack all of your dress shirts and suits inside of the bag. This travel bag is one of the top-selling designs because it’s so convenient to carry and has plenty of room for essential items. It comes with a detachable strap to make it easier to carry with you. The bag also has a special Wally clamp design that can hold up to 6 different garments and uses your own hangers, allowing you to easily pack and unpack without folding your garments. There are also multiple pockets for organizing your shoes, toiletries, socks, ties, and other necessities. The best thing about this is that you can fit all of these clothes, get wrinkle-free confidence, and the bag still fits in the overhead bin. You don’t have to worry about checking bags or anything that will hold up your flight time. For those who travel as lightly as possible and want to keep their garments pressed to perfection, this is the perfect travel garment bag to go with. You can hang up to six different garments, including suits and dress shirts. There are also multiple compartments for other items. While it doesn’t come with wheels, the bag is fairly small and easy to carry unless you have some extremely heavy wool suits! If you have been looking for a stylish garment bag that will hold your suits and look incredible while doing so, the AmeriLeather Leather 3-Suit Garment Bag is the most affordable option. With top grain genuine leather and book-opening design, you can fit up to three full suits inside of the bag. The copper-tone hardware goes along with the leather color nicely. You can actually pick from five different styles and colors. The tan leather is a truly beautiful bag but may be susceptible to travel debris and dirt. There are several internal pockets and organization opportunities. You can pack up all of your essentials and have quick access to them when you get on the plane. While the leather is beautiful, it’s unclear how waterproof or resistant the bag is to the elements. The outside pocket is the perfect place to store the essentials, and there are two other zip-up pockets for shoes, toiletries, and electronics. Overall, the bag is a little small, but it’s lightweight enough that you can carry it and store anywhere. Packing is quick and easy with this bag, but it won’t hold much more than your favorite suites and shirts. While we love the look of the AmeriLeather bag, it doesn’t leave much room for anything but your three suits. There is a little bit of extra storage room, but if you are staying longer than a weekend, you may not have enough room for any other clothes beside your suits and maybe some sleepwear. 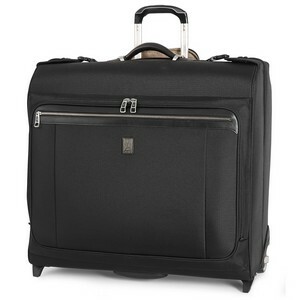 The Leisure Vector 44” wheeled garment bag is a thing of precision and efficiency. The wheeled design is convenient, and the book-open style of the bag will make it easy to pack up your suits and dress shirts. While there isn’t a ton of space with this bag, you can easily organize everything in a number of other zip-up pockets and pouches. Most business travelers pick out this bag when they want to save and get something almost as good as a Travelpro. There are some things about the design that is inconvenient, such as the handle length. If you are a tall individual, you may not like the short length of the extended handle once pulled out. There are a variety of pockets inside that help you pack up your socks, shoes, ties, belts, and toiletries. Customers stated their Leisure bag lasted years after purchase. 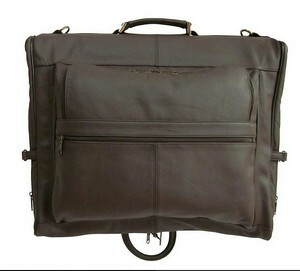 The Leisure garment bag is the perfect purchase if you want a bag that can go with you anywhere. It will fit into any compartment or under any seat. While it is small and easy to roll through the airport, we did find that the handle is rather short, which is an issue if you are over 5’7” and don’t want to carry your bag with you. That said, this bag stores your garments perfectly and gives you lots of additional pockets to organize miscellaneous items. While the convenience of rolling carry-ons is a favorite for business travelers, there are also lightweight shoulder strap garment bags that work really well and almost better than a suitcase with wheels. The strap is adjustable and easy to wear with the Olympia Luggage Deluxe Garment Bag. We liked that it has a classic black look and multiple pockets in addition to the wrinkle-free suit guarantee. The wheeled design is perfect for fast business travelers who want to get to the terminal quickly. The coil zipper and lockable front zipper also ensure that your items will always be secure. We thought that this design was the most secure and efficient out of the other bags that we tested. The interior design has multiple pockets and an organizer in the front pocket. You can slip all of your ties, belts, socks, underwear, and toiletries for a weekend away in these pockets. While it’s not a very big bag, the Olympia garment bag surprised us with its quality and ease-of-use. You can take this bag anywhere with a short week’s worth of clothes and keep everything organized. 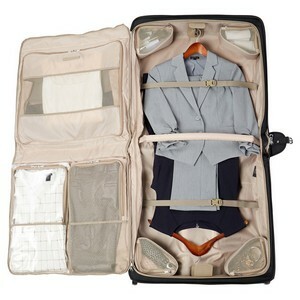 While you can easily store a suit in the Leisure, this garment bag will force you to pack light. There are multiple pockets making it easy to organize all of your gear and toiletries, and we like the shoulder strap design. Most customers who purchased this were business travelers looking for something that could go under the seat and still provide a lot of room inside for sleeping gear, shoes, and toiletries. 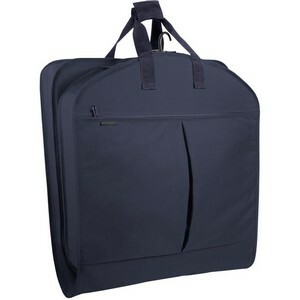 Garment bags are the perfect gift for anyone in business. They provide options for transporting suits and other garments without causing wrinkles or leaving them open for stains and debris. There are small and large garment bags, and they can fit into your carry-on along with other personal items. When you start to look at bags as a jet-setting business traveler, you probably aren’t sure what type of garment bag you need. There are hundreds to choose from. Whether you are looking for a wheeled carry-on or you want something guaranteed to keep your suits wrinkle-free, you should first decide how you want to travel. If you don’t plan to check a bag at any time, then you definitely want to pick a bag that can fit all of your clothing and offer some organization as well. Most of the decent garment bags are going to cost over $50. You can find some that are under this amount, which is considered economic garment bags. These are designed to be lightweight and easy-to-carry with a few pockets to store other items. There are also rolling garment bags, which are typically over $100. These are higher-class bags that can fit more suits and dress shirts, as well as more shoes and toiletries. These easily fit into the overhead bin as a carry-on, but they may have issues with wheels coming off. In some of the high-end cases, you can find bags over $500 that are made from genuine leather or designer brands. You don’t need to spend this much to get a high-quality garment bag, however. Most bags are measured in inches from height, width, and length. However, they may also have capacity. You typically want a bag that can handle more than 85 liters in capacity. This is the minimum when you are packing suits, shoes, ties, belts, dress shirts, underwear, and any casual clothes that you might need. Typical carry-on size for these bags is around 21” or smaller, but typically, the roller garment bags are larger than the handheld or shoulder strap garment bags. If you are traveling for longer than five days, you may want to look at the larger garment bags first. This really depends on the traveler. If you are the type of person who likes to hold all of their stuff close, then it may feel awkward to pull along a small garment bag on wheels. Some garment bags also don’t have the sturdiest wheel design, which leads to wheels need replacements. The quality of the wheels is the most important part of purchasing these bags. The two-wheel models are best when looking at roller garment bags. This is because they are lighter and easier to move with. Most roller garment bags will have handles that can stowaway and extend. However, the length matters the most. If a handle is short, then you may have to stoop to wheel it after you, which feels awful and doesn’t add anything for convenience. There are some cheap brands that don’t extend the handle enough for those who are over 5’7” tall. Every garment bag should have at least two other pockets where you can store everything else besides your suits. You’ll need extra space for your toiletries. The best garment bags have multiple pockets that are lined with mesh and help you designate between “wet” toiletries and dry goods like socks and belts. If you have a lot of dress shirts and suits that you are hanging, then this will add to the convenience and sturdiness of your bag. Garment bags with locking clasps are preferred because it will secure your bag. If you are traveling greater distances, then you want to make sure your bag won’t come open in the overhead as you travel. Hanger design is important if you don’t want to wrinkle your shirts and suits. You can easily store them all with separate hangers, and then fold the clothes without any chance of wrinkles or stains. Your clothes are totally protected within these types of bags. Nylon and polyester are typical for some of the cheaper garment bag designs. While nylon bags are pretty indestructible, the look isn’t always high-quality. Other bags are made from more durable materials or genuine leather. If you have a bigger budget for your bag, then you should upgrade to one that can withstand all of the elements with a water-resistant exterior. Since a garment bag is different than a suitcase, you need to make a list of what you plan to bring with you. Most business travelers are very efficient and may pack one or two suits with other options for dress shirts, ties, socks, and belts. In addition, you may have extra long pants or other needs that require a bigger capacity bag. The top-rated garment bags have hooks attached to them so that you can use your own coat hangers to carry your special suits and transfer them directly to your hotel’s closet once you’re unpacked. There are actually multiple types of roller garment bags. They typically come with two or four wheels, but there are also three-wheel design bags. The easiest to use in our opinion are the two-wheel design bags as you simply pull the handle and lean the bag as you walk. The four-wheel bags are becoming more common, and while these seem more convenient, it also seems that the wheels can get stuck or move poorly when you are trying to go around a corner. Lastly, if you prefer to keep your items close to you at all times and you don’t like pulling the handle, then it’s best to go with a handheld garment bag. These are often made to be more lightweight and fit into smaller spaces. You can use garment bags for any types of dress clothes. However, some are made specifically for suits. There are some garment bags that work better for suits and dresses simply because it offers a wrinkle-free guarantee. These are the bags that have hangers typically. You can attach your dress clothes to the hangers and then secure them within the bag design. This is supposed to guarantee that they won’t fold while in transit. What we see a lot in these bags is a nylon construction with reinforced zippers and waterproof materials. Most travel bags use nylon because of its ability to protect against water. This works better than leather and polyester materials, which you may see on high-end and low-end bags. You may find there are some garment bags made out of harder materials like polycarbonate or polypropylene. These are sturdier, but they won’t be better for fitting into a tight space, such as under a seat or in a crowded overhead bin. While there are a lot of garment bags on the market right now, the best ones will be what matches your budget and travel style. If you are constantly on the go and love to walk with your hands-free, then it’s probably best if you pick a shoulder strap garment bag that has plenty of room inside. For this reason, we really like the Olympia garment bag. However, the best bag on this list has to be the Travelpro. With tons of high ratings and lots of customer satisfaction, we agree that it’s got the most space and organization, as well as convenience. You won’t go wrong with a Travelpro bag, and it will probably last you 10 years or more.